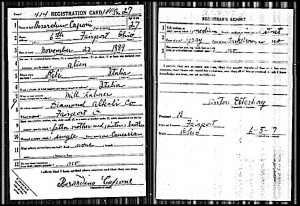 Berardino Caponi first appears in the Painesville, Ohio, area in 1917 when he registers for the draft for Word War I.
Berardino Caponi was born on November 23, 1889, at Pili, Italy. He registered for the World War I Draft on June 5, 1917. He was living at 6th Street, Fairport Harbor, Lake County, Ohio. Berardino was not married, and was employed by the Diamond Alkali Company in 1917.